I suffered from my own demons in the past but know there is a light at the end of that road. You have to find joy each day and be at peace with yourself. I can truly say that Supernatural saved my life and has given me a reason to keep going. I am blessed to be a part of the SPN Family. I have to say, Karla, that what you have written here strikes very true for me. I have never attempted suicide but I have thought about and come close. I suffer from depression and anxiety. Sometimes it feels like the world is closing in on me and I have no way out of it. I could give you example after example of all the things that have happened to me but it would fill an entire book. I work on a day-by-day basis. I tell myself that every day is a new day and that I can always start over. When things are particularly bad, I find someone to help me share the grief. Sometimes that works and sometimes it doesn’t. It’s a daily struggle. But I do find as much joy as I can. I am blessed to have a niece and nephew that make me feel like I am the best person in the world. And my wonderful sister who never judges me no matter what I do. Supernatural has also been a big part of helping me. Seeing two brothers who truly understand each other like no one else always gives me hope. To know that the brothers are just as messed up as I am and that they somehow always make it work, it shows me that not everything is lost. I’ve watched it since the first episode and can’t stop watching it. We have to remind ourselves that every day is worth living. And that giving up is not the answer. Always fight the fight. Found this on the #AlwaysKeepFighting hastag on twitter, and just wanted to say how beautiful the idea is. I know you’ll help many people through their struggles. So sorry to hear of your loss. I nearly lost one of my sisters to suicide a few times when she was younger, and I’ve had suicidal thoughts myself. Compassion like yours is what helped me get through those dark times, and, like you, I hope to pay it forward, too. I’ve been through hell and back this year. I lost a best friend to suicide last summer from being bullied, and felt as helpless as it can get. I lost my mother in April to breast cancer, and I had to switch schools during this, my senior year of high school. but I always stay strong to the best of my abilities and always keep fighting the feelings of loss in my heart. because I know they’d want me to move on with my life and live for them. I hope you find the person you are looking for, Ma’am. I shall always hold this website dear to my heart. Such a beautiful letter! Jared’s answer was absolutely perfect. Helping others does keep me from dwelling on negative issues while building self-esteem. You are so right that through connections we find the answer. We all look at social media and see people more perfect than ourselves, and we come up short – how could we not with the professionally prepared, photoshopped images we see? To see some of our beautiful idols break down that wall and reach out a hand to say “You are all beautiful. Everyone struggles. You are of value.” is a powerful thing. 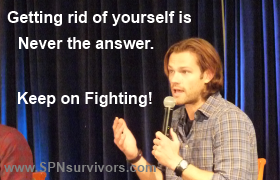 To use social media for #AlwaysKeepFighting and #SPNSurvivors is also powerful. Connection is everything. Keep reaching out to others no matter how you yourself feel today. You have something to give and we are all glad you are here as part of our family. Thank you Karla, for starting this site. Hi Karla. I want to thank you. Every single day I contemplate taking my life. I get through by distracting myself with whatever I can. My kids, housework anything. It’s constant. I’ve learned how to put on a good face and not let anyone in. I have Aggressive MS and rheumatoid arthritis but worst of all I have Hansen’s disease or Leprosy. Because of all of these illnesses my husband divorced me, my brothers and sisters have nothing to do with me and even my friends just left. I lost my home, cars everything. My kids are always struggling. Everything I do I do alone. I even signed up for gishwhes knowing I was the only person on “my team”. Is a pathetic existence. It’s been a hard long road and it’s taken a toll on me emotionally. Following your group on Twitter has helped me so much by helping me gain the encouragement to keep going. While I still can’t wait to “just be done with this life”, at least I can muddle through it a little better because of you and the SPN group. Wow! This fan helped start this group! Just wow! They should feel special and so should you for starting it! My family has SEVERAL health problems and it hurts to watch my dad go through his flares. While I cannot fully understand what you are going through, I can mildly relate. Keep your head up! Try support groups and keep your kids close! Best of luck and lots of hugs! I have survived for 60 years and will keep on surviving. I told Jared that if I can survive 60 years he could too. blessed be to all of the other survivors out there. I fight the demons daily. They almost had me late in Jan but I took that scary big step and got help and kept reminding myself AKF. I was in a Partial Hospitalization Program (insurance didn’t cover more) and shared the AKF story and why I kept saying it to help remember. It’s saved me and I don’t find shame in sharing my story. I am a survivor of three attempts. Jared has saved me and I hope he saved that girl. If any of you haven’t read family don’t end with blood I recommend it. Shows how the we all have helped each other the cast and the fans. I started to attempt suicide 10 days ago. I was watching Supernatural at the time and glanced up just as a close up of Sam appeared, eyes full of sorrow, looking right at the camera, right at me. I fell apart but the breakdown was enough for me to stop for a moment and think. I’m still on the edge but I’m fighting as hard as I can. I’ve immersed myself in Supernatural and, while it’s probably not the healthiest way to deal, it’s keeping me here a little bit longer. Of course, the hope is that it will keep me going long enough to find something else worth fighting for. I wish I would have known about this site a few years ago. Things in my life had been going wrong and it felt like I couldn’t live through the pain. It had even gone so far that I was coming up with plans on how it was going to happen. To know there are other people out there that are brave enough to come forward to talk about a “taboo” topic such as anxiety, depression, and suicide, it means a lot to know I’m not alone in my struggles. I found this site through the book Family Don’t End With Blood and I’m glad I did. Not only the characters of Sam and Dean, but Jared and Jensen have taught me that there is always something you need to live for. Sometimes it’s just something small and other times it’s the bigger picture, but there is always a reason. To anyone that has just wanted to give up, it’s not an option. Although I have never actively tried or even wanted to kill myself, I have on a few occasions just wanted it over. I have been to the point of just giving up. Most recently when my partner of nearly 30 years passed away from a heart attack. It’s just over a week til the 2nd anniversary of his passing. And it’s still really bad sometimes. I’m sharing this for a couple reasons. 1st to thank my SPN family for just being out there. Supernatural saved my life 2yrs ago, Jared gave me a reason to make it to the next day. My partner James was a huge supernatural fan, had watched faithfully every episode, me not so much. Until he was gone. About a week after he died I was at the lowest I’d ever been, I’d stopped eating or doing much of anything. I was just done. Then I was trying to go through his stuff and turned on his tablet. It was set on supernatural. I watched S2 E22 all hell breaks loose part2. That Dean never gave up. So I started binge watching from the start. Then I watched everything SPN on YouTube. That’s when I saw Jared open up about his depression. It stopped me in my tracks. That’s when I knew I couldn’t give up. That somewhere there was someone that needed my help just like I needed Always Keep Fighting. Yes everyday is a struggle. I often still wonder if anyone would miss me. Yes, I tell myself every morning, every night, yes I would be missed. And knowing that gets me out of bed every day, it feeds me, it keeps me going. I AM A SURVIVOR!!!!! And I will Always Keep Fighting!! Just an amazing story, the fact that the kid got up and asked that was so brave and Jared’s response was perfect. Sometimes you never know when a hey how are you doing lately could save someones life, sometimes you just need to know that someone cares, that you’re not invisible.